I LOVE Disney World! I also LOVE to eat! So needless to say, eating in Disney World is on my list of super awesome things to do. In the 10 or so times I have been to Disney, I have eaten at several of their restaurants. Many of my favorite are at Epcot, so that is what I will be focusing on today. Several of them won’t be mentioned in this post. So if you have any questions about places, feel free to ask me in the comments. It is very possible I have been there and am happy to share my thoughts with you. you feel like you are in another country. In fact, you could eat at a different country every day if you wanted! We had the Disney Dining plan this trip, which made eating out very easy. If you are light eaters, I’m not sure it is the best option, because you do get LOTS of food on the plan. But I loved it! The friendly servers work with you no matter what plan or no plan you have. They are one of the many reasons eating in Disney is a great experience. My meal consisted of lamb, chicken, couscous and assorted vegetables. Even though this isn’t my favorite type of food, I think they do a really good job with the flavors. I do love the deserts though! So much so that I started eating before I took the picture…sorry! I had the Bastilla which is crispy leaves of pastry topped with vanilla cream & sprinkled with toasted almonds. Super yummy! Prost! My family’s favorite place to eat in Disney is the Biergarton Restaurant. It is located in the Germany pavilion of Epcot. We love it for several reasons. The first reason is the food, which is served buffet style. Schnitzel, bratwurst, spatzle, strudel…you name it, they have it on the buffet! And we love it all. Eating a late lunch here keeps us full for the rest of the day. And it saves money too, because we can skip dinner! The second reason we love it is the entertainment. This guy came around to our table and played for us! There is always something going on…music, dancing, singing! They get the patrons involved as well. You may find the occasional over-served patron, because they serve a lot of beer here, but usually everyone is just having some good Disney fun! The last reason we enjoy this restaurant is that you are served by actual German citizens. That is the case in most of Epcot’s restaurants. (the servers reflect whatever country you are in) We love to ask them questions about their homeland. In fact, one time we were actually planning a trip to Germany and our waiter was very helpful with advise. By the way, be sure you make reservations for all of these restaurants! We see people being turned away every time we are there. If you have a little princess, make sure you eat at Akershus Royal Banquet Hall in the Norway pavilion of Epcot. Take your autograph book because you will get to visit with many of the princesses in person! I have many pictures to treasure from this meal. We ate there for breakfast, which gets you into the park before it opens. That is pretty cool too! I would never be able to get pictures like the one below after the park had opened! The Mexico pavilion with just us! A new favorite that we tried the last time we were in Disney is the San Angel Inn that is located in the Mexico pavilion. Yes, that one right there in the picture. I had always thought it looked like a neat place to eat, but we have mexican food all the time at home, so I didn’t think we should do it on vacation where there were so many other choices. Man, was I wrong. This is not the typical “mexican restaurant” in your hometown! Really amazing food and outstanding cocktails that I have never even heard of. 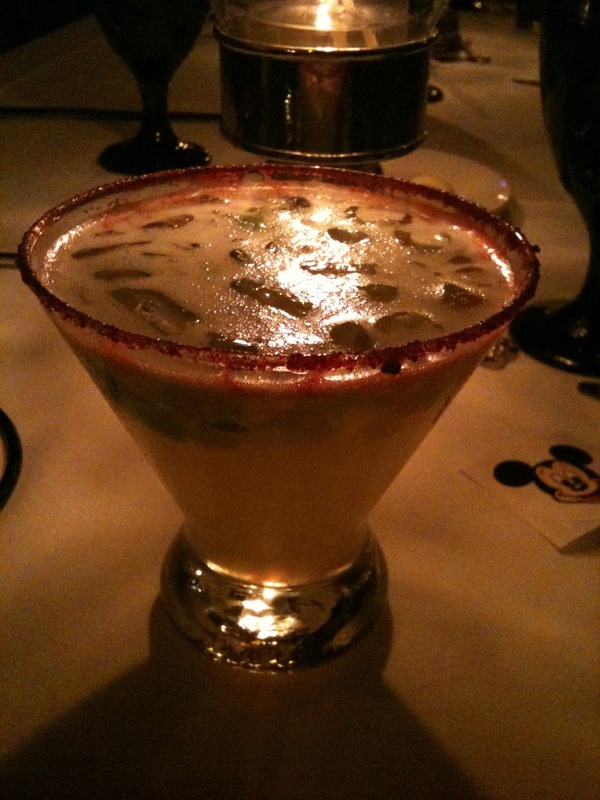 I had a jalapeno margarita that blew me away with exotic flavor! I would go back for it alone! The atmosphere really adds to the experience. Kind of dark, so I don’t have good pictures. Ask for a seat overlooking the water and volcano area. They were completely packed and yet the service was excellent. I will be adding it to our list of favorites!Please comment and tell me what your favorite Epcot restaurant is! I would love that! What is your favorite place to eat?